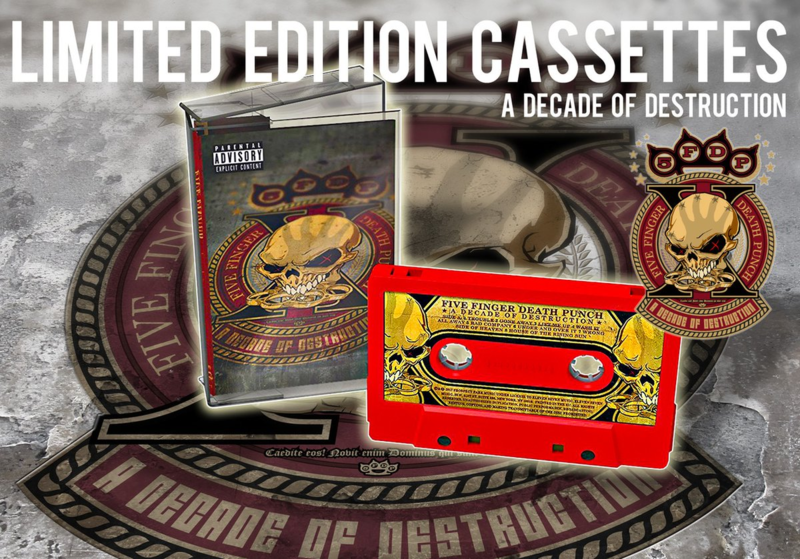 Are cassettes really making a comeback? Interesting article after I was a little surprised to see one of my current fave's available on tape!!! Dolby B, Dolby C, HX Pro, On My !!! My hoarder traits have been vindicated !!! I was forced to buy a guys 200 tape collection of great classic rock for ....5 bucks at a yard sale many years ago ( 6) . I also would buy some spacey tapes at good wills sometimes. I think .25 for a tape. I played one a year ago playing chess and was blown away by the clarity. But then again, my hearing is high challenged. That's a negatory, good buddy. 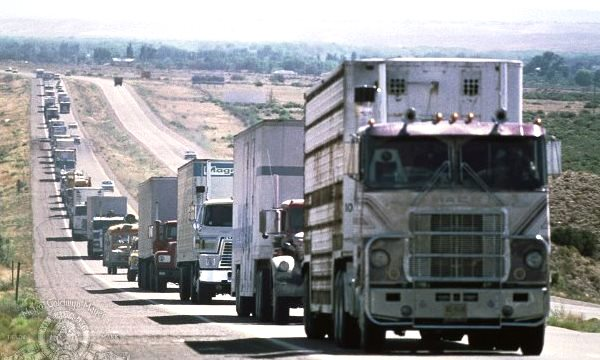 Are all those trucks hauling your tape collection ??? They're coming to help me clear out my hoard so I can have just 2 systems in the cave. And one will def. have a Nackamichi tape deck in it. My other one can have one too since I have 2 Nak's and a plethora of other tape decks too. I know what you mean. I could ad some stuff my Mom did away with that she had NO right to SELL. She was safe-keeping some things for me, and she sold em!. But she did give me life so I eventually forgave her for the things she sold off. Agreed. Mom passed away this year and all was forgiven many many years ago. I did however rebuild my beloved complete Styx LP collection !!! Found a bunch of esoteric variants since then, etc. Obsessed yes. And snagged a re-issue of their LP's since their breakout Grand Illusion !!! Internet, love it !!! My Mom sold a coin collection of mine for one thing. I held a grudge for 2 years. When I forgave her, I got back to coin collecting and my collection went to 20 times the old value. Pays to forgive doesn't it! I love Styx! I did a lot of home remodeling listening to Styx's greatest hits cd. That and Steely Dan's greatest hits got rotated a lot. My neighbors probably know the soundtracks by heart like I did there for a while. But the coolest part of this story is I finnaly made it to this thrift store 5 or 6 miles from me that I've wanted to got to for years but things just kept comming up. Until Thurs. I think. There was a guy I helped out and he has a section in there for selling all kinds of things. There is also a guy who sells records here in the flea market store and in Raliegh too. I checked out his record collection and it was impressive. 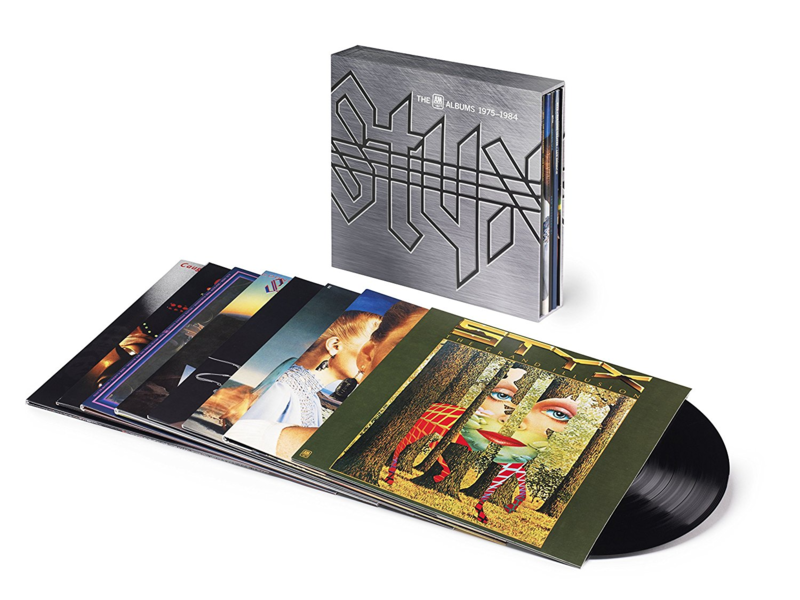 And what cought my eye the most was a MINTY ( that's what he had on the 12.00 sticker price tag) STYX , The Grand Illusion Album. I took it out of the sleeve and it said BUY ME! It was glistening with newness! JUST LIKE THE ONE IN YOUR PICTURE! But I'm sure I have one but I don't know if it's like new. But I wanted to come home and see how my copy is. I've yet to check though. But that's cool, you rebuilt your Styx collection up better than it was it sounds like. Just like my coin collection. My prized coin was a counterfeit nickel. My mom did'nt sell that nickel so 2 years was lost for NOTHING. We had many more years before she passed. But I'll never get those awful 2 years back. I always thought it was done with a pencil. Finally, the classic BIC pen will be useful once again! People are idiots, next there will be an 8 track fad. Does anyone have a Nak Dragon or heard one? Never did, but it makes me curious. I know it's odd coming from a vinyl guy, but at least vinyl can be silent, tapes always hiss iirc. Yes heard many they are excellent. Tapes if recorded correctly are quite as a church mouse. Yea - I never had or heard anything approaching that quality level, I knew a guy that had one in his Jeep though. Crazy expensive back then. The hiss isn't the big problem for cassettes. The big problem(s) is (are) fundamental -- slow speed linear recording and tiny track width. Philips developed the cassette mostly for 'talking letters', dictation and other more or less lo-fi applications. It is a credit to Philips, Dolby Labs & others (who originally developed chromium dioxide tape formulations? BASF?) that such good hifi performance was ever wrung out of cassettes. Dolby B NR, for example, is a double-edged sword. As a compander, it reduces hiss by boosting treble upon recording (10 dB) and then cutting the treble at playback. The net result is less HF noise (since the noise isn't 'recorded' per se, so it's cut by the 10 dB 'de-emphasis' upon playback). The problem is that the maximum signal levels at low distortion decrease at higher frequencies. This is true for all linear recording media, but it's a big problem at the slow speed and small track width of cassettes. The frequency response specs for cassette decks was reported at -20 dB (20 dB below). At 0 dB, the treble response in particular is much more limited. "Metal" tape formulations helped with the HF extension problem, too, but didn't ever quite catch on -- with the result that metal formulation tape is fairly rare and consequently expensive. In fairness, Dolby HX addressed the high frequency headroom problem with some success, but I was never terribly impressed by either Dolby C or HX Pro "encoded" tapes I've made/heard. Dolby B is borderline. 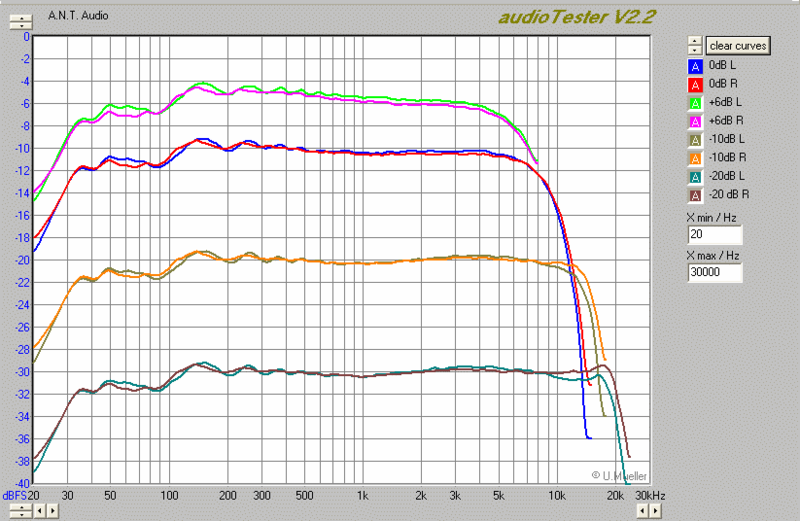 No NR at all "sounds" best to me, but (of course) at the expense of 10 dB more hiss. 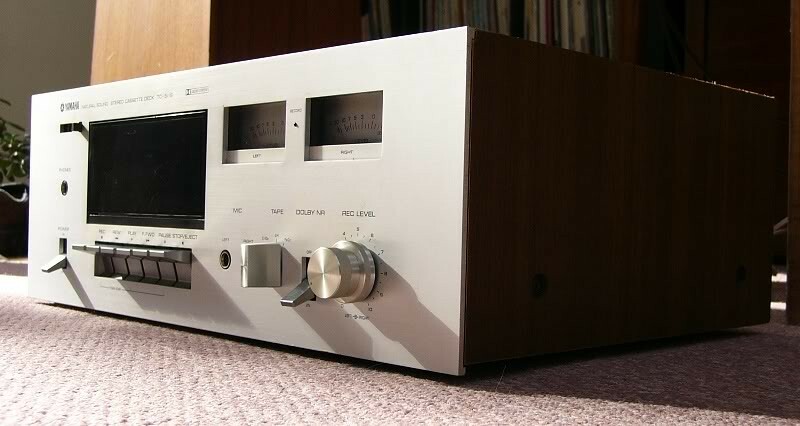 My experience with Nakamichi decks is that they really do sound better than most -- but they're finicky. The ones I've owned (or those of folks I know) seem to require more care, cleaning, demagnetizing and even repair to maintain good sounding performance than decks from other manufacturers. that sounds OK and is very, very easy to use. Just to illustrate: here's what looks to be some "raw" (no NR, no HX Pro, presumably Type I tape) frequency response data from tapeheads.net from a Marantz HD-7 cassette deck. From bottom to top, this is at recording signal (input) levels of -20 dB, -10 dB, -6 dB and 0 dB. Note what happens to the recorded bandwidth as the signal level goes up. ^^ Wow - thanks a remarkable change! 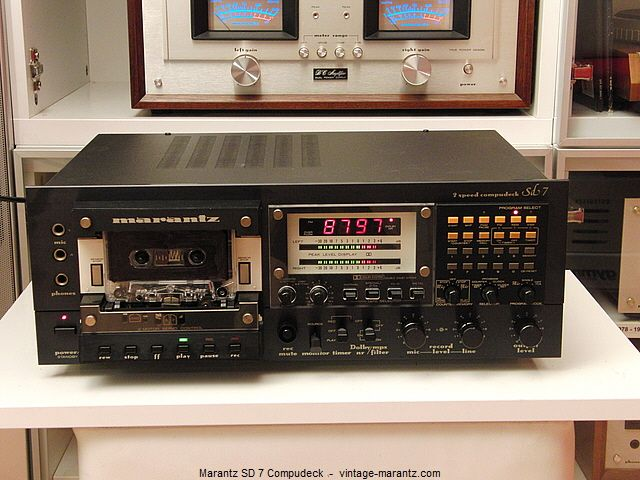 ^^ Side note: Marantz, that thing looks cheap - NOT. Some nice young fellow from craigslist came and took my entire cassette collection and my last 2 cassette players a couple years ago. There was sheer joy in seeing all those tapes leave never to return. Well, again, some of the later tweaks (particularly HX-Pro) do help... but at the expense (perhaps) of less deck-to-deck compatibility. The Philips cassette 'standard' required compatibility between decks bearing the Philips "CompactCassette" mark. It can be argued that Dolby, non-ferric formulations, etc., produce tapes that can be listened to on another deck, but won't sound quite right. That not quite rightness, I think (! ), got to be more and more of an issue as more and more signal processing tweaks were made available. Not a big deal -- until and unless someone has a bunch of tapes made one way on one deck, and then that one deck defecates the bed and has to be replaced. There were also several companies (notably BIC and Marantz) who made dual-speed tape decks. The higher tape speed (3-3/4 ips), of course, improves everything at the expense of recording time -- and compatibility. There was, AFAIK, never any industry standard for 3-3/4 ips EQ; I presume the Marantz and BIC decks probably used different EQ. Maxell UD-XLII) was fairly cheap due to the format's popularity! I still have a bunch of nearly 40 year old tapes, recorded on a (purchased used) Yamaha TD-511B (a very basic 2 head deck) that (still) sound fine. 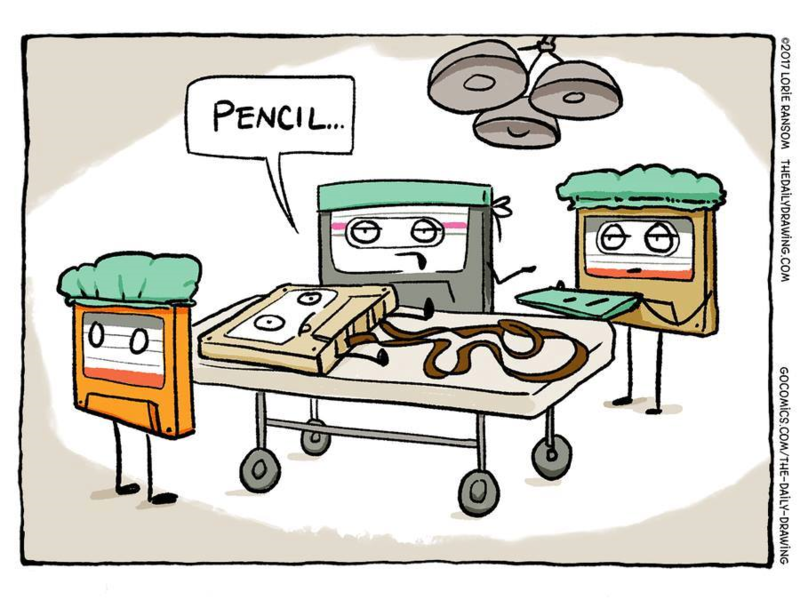 Did anyone ever have a prerecorded cassette tape that lasted for more than a year? They used the cheapest materials and they would always jam and break. If I dig out my box of old cassettes in the basement I know 95%+ of the survivors are the ones I recorded myself using quality blank cassettes (usually Maxell). Very impressive and most informational essay thus far @mhardy6647 !!! I must ask for today's recent releases of cassette tapes, is there a preferred standard? I will agree mark on 95% of what you said. Yes the Nak's were very tedious. The Dragon you could adjust the azimuth and yes they required some care. That being said are in high demand today. Myself i had a high end Yamaha deck with dolby C boy was it just the cats meow. I'd record CD's to take in the vehicle and the Denon metal HX pro IIRC. Recorded correctly into the plus 4-6 into the red and they just ate it up. 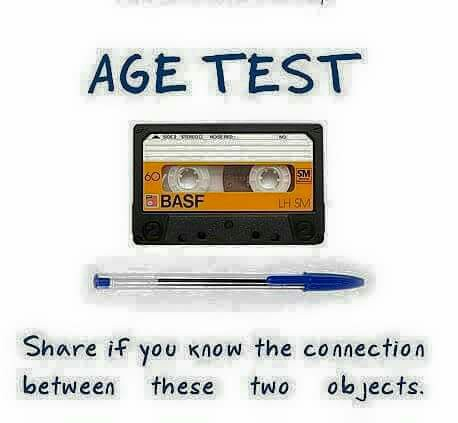 I'd challenge friends to pick which was CD and Cassette 90% of the time they would get it wrong. I still have those cassettes at work playing on a boombox and I'll be darned if they do not still sound good for a 30+ year old cassette. I'd love to compare them on my old deck to see if there is any degradation and how much. I'm sure they have lost a step after the boombox but maybe they would surprise me. These days if they came out with portable players I'd have to think it would be flash drive driven.... audiophile of course. IMHO...this is a waste of time. TT that are still running that are decades old. 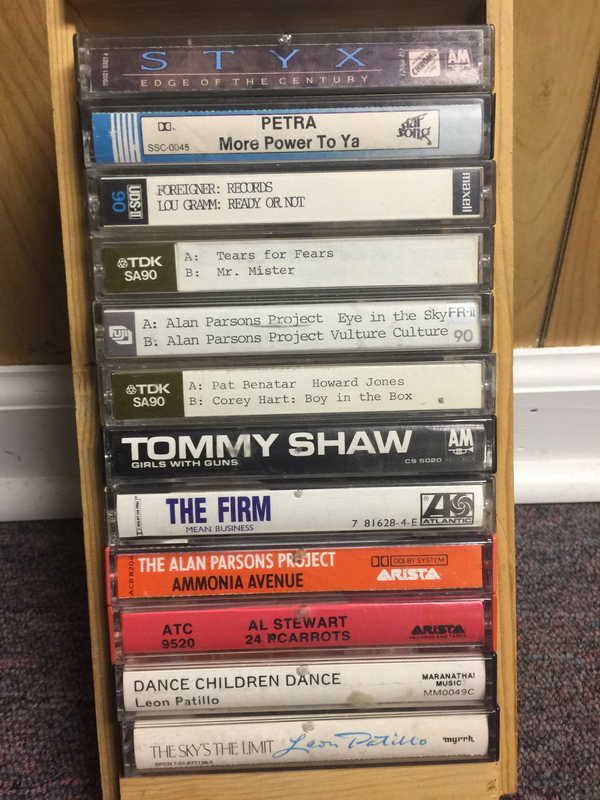 Very little inventory of cassettes or players of old. As i remarked in my post WHY cassettes when SD cards are so prevalent. Other than the anolog aspect it seems like a waste as you stated. Funny thing an article i read the other day stated most millennials are not even using the vinyl they are buying it's all part of a status symbol. The buying of vinyl and vinyl peripherals is tapering off fast. Interesting to see where it will be in 2-3 years. The buying of vinyl and vinyl peripherals is tapering off fast. Interesting to see where it will be in 2-3 years. There are some of those horrific grey plastic shell commercial cassettes here that belong to Mrs. H. Tom Jones, Barbara Streisand, Ringo Starr... they're Zombie tapes -- they can't be killed... They must be more than 40 years old. I just recently acquired a JVC TD-V541 three head deck. I got it to play back some of the old tapes I recorded in the 70's and 80's and yes, they still sounded fairly decent, some had a couple of dropouts, and I have a stash of unused chrome and metal tapes. I also have a few vintage/rare albums I like to record. The deck is a direct drive and has had the troublesome motor control capacitors replaced. It's equipped with Dolby B/C and HX Pro and, on my tube rig, sounds pretty decent. Lately CD's have been sounding a little brittle to my ears (my ears have had a rough life) and the tape deck does an excellent job in reproducing the smoothness of a record album. I enjoy listening to it and it might be a keeper, providing it keeps working. It's a complicated machine that's old (cir. 1991), so thus, it wouldn't surprise me if problems would soon arise. I wouldn't recommend one to everybody, but, so far, it works for me. Now, I got to hit my mom up to see if there's any more of my tapes at her house.